Monday was the first field trip of the season with the Caloosa Bird Club. 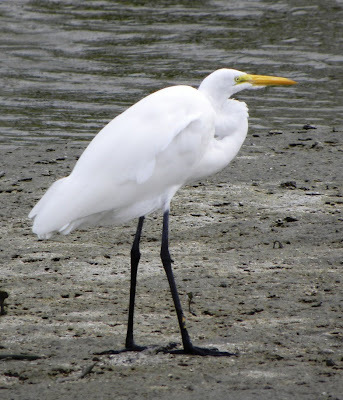 We went birding at Little Estero Critical Wildlife Area and Bowditch Point Regional Park, both on Fort Myers Beach. There was a good turnout. As you can see, quite a few people brought spotting scopes and they set them up so the entire group could see the birds close-up without disturbing their habitats. This is an interesting picture because it illustrates cooperative feeding with several different species of birds working together to find food. 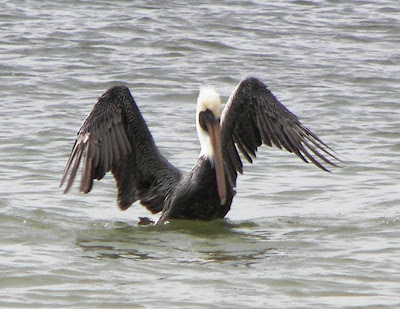 The two Brown Pelicans are a youngster (with the dark head), and a mature adult (with the white head). A mature adult Brown Pelican. Bill took this fabulous picture. 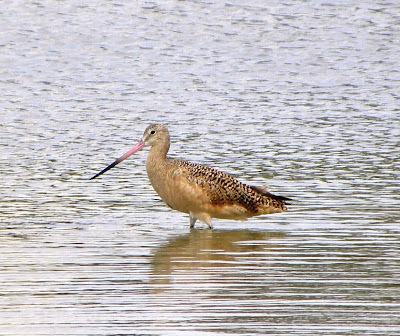 This beautiful large shorebird is a Marbled Godwit. He is about 18 inches tall and eats worms, mollusks and crustaceans - with an occasional grasshopper to round out his diet. 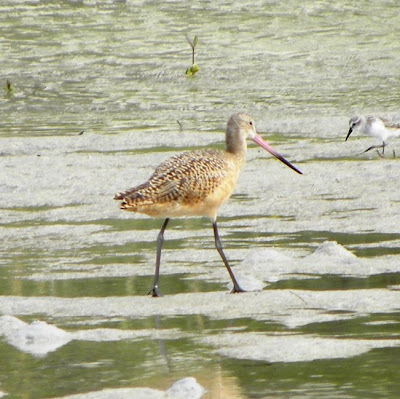 I love his long pink and black bill that he uses to probe deep into the sand to find the tastiest morsels for dinner. I don't know if I ever saw one before or not - but Bill tells me it doesn't count until I have a picture. 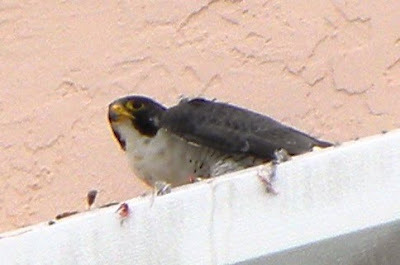 Way up on a ledge of one of the hotels by the beach, one of the birders spotted this Peregrine Falcon. He was eating what looked like a Ruddy Turnstone. 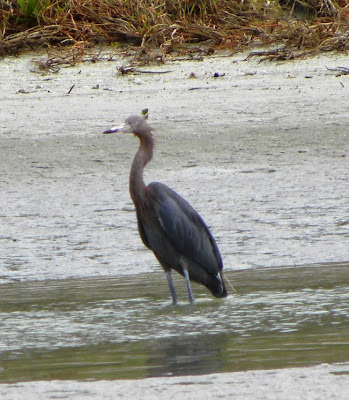 One of the less common large herons - a Reddish Egret. 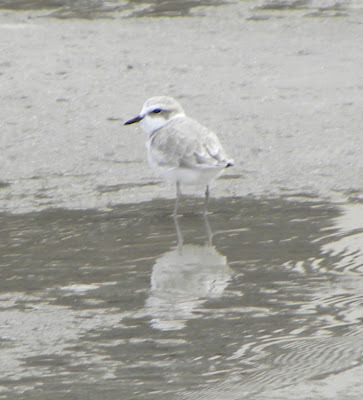 Another new bird for me - a Snowy Plover. 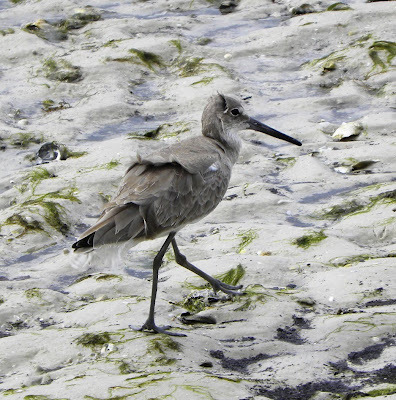 He is a very small (6-inch) shore bird. There were a total of 5 different kinds of Plovers that the club spotted - but I was happy learning and photographing one. 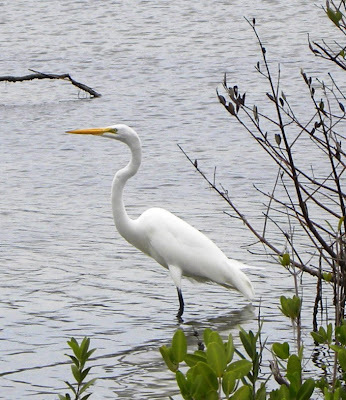 The Great Egret is a graceful bird with his long, slender neck. 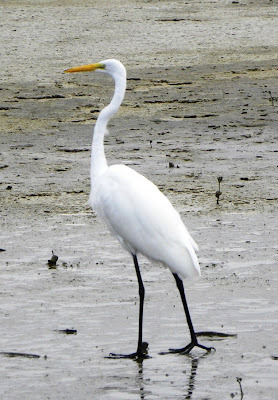 If he had bright yellow legs - he would be a rare white morph of the Great Blue Heron (found only here in Southern Florida). I have hundreds of pictures of these birds - but I can't help myself - I take more every time I see one. 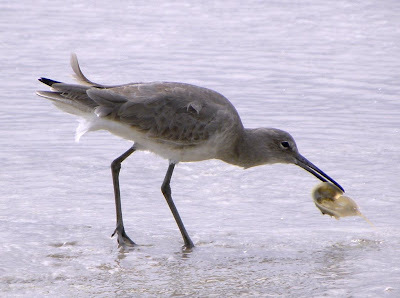 Another bird that likes to feed on mudflats or on sandy beaches at the ocean's edge, a Willet. 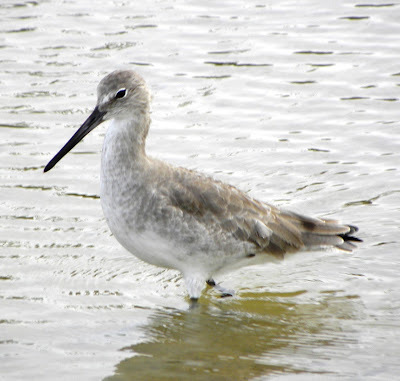 He is a large, over a foot tall, shorebird that mingles with the smaller Sandpipers and Plovers. He blends in well. Notice the Crown Conch he is just about to step on. Lunch time! 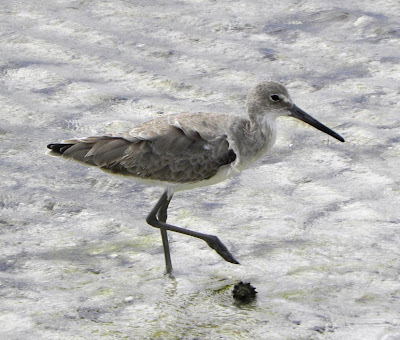 I've seen and photographed Willets before, but now I've learned them and will be able to identify them again - or so I think. So many of the shore birds look alike - and have different coloring according to the season, their age and whether they are breeding or not. 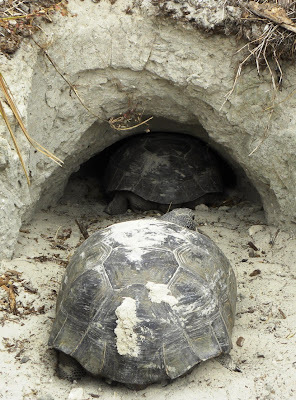 Our next stop was Bowditch Point Regional Park - home to many Gopher Tortoises. 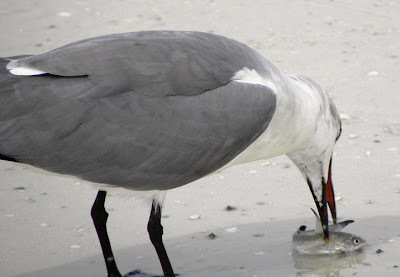 We watched this gull grab his lunch out of the shallow water - and quickly eat it. Talk about fast food! It was lunch time for this Osprey as well. 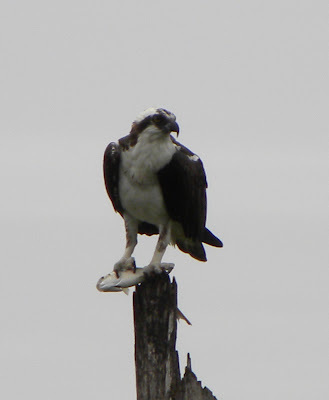 The Osprey are just starting to think about settling down and starting their families. After the birding group finished lunch at the picnic area at Bowditch Point - we counted the number of different birds we had seen - 42. That number is small for this group - but almost overwhelming for me. 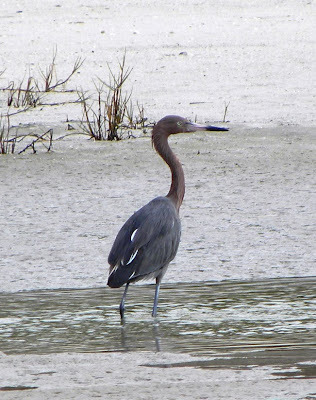 Bill and I decided to continue our birding trip at Bunche Beach across from Bowditch Point on the way to Sanibel. One of the birders told us there might be a Bald Eagle nesting there. Bunche Beach is a very strange place. Walking down the beach, it changes from sandy to muddy. 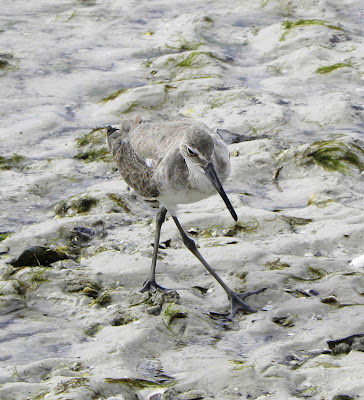 The beaches are littered with oyster shells and the further you walk, the worse it smells - but it's a great place to see a variety of shorebirds - and some very peculiar humans. According to one web article, Bunche Beach was historically a black beach during segregation. The park has a lengthy, narrow strip of sand that stretches from just south of the Sanibel Causeway to a residential area behind Fort Myers Beach. There are great views of San Carlos Bay and the Gulf of Mexico. The waves are small and water depths near the beach are very shallow. It is a popular spot for wade fishermen, kayakers, windsurfers, kitesurfers and "people wanting a reclusive beach experience." 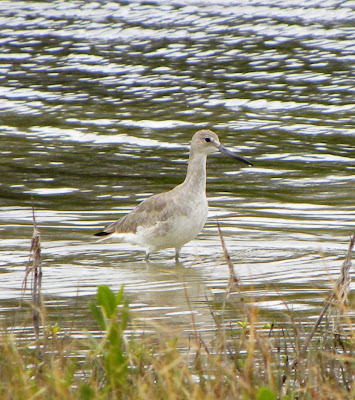 We didn't see any Bald Eagles - but I was able to properly identify another Willet. The wind had picked up and you can see his feathers ruffled in the breezes. We had a great day - got lots of exercise and learned more about shore birds than my brain can hold.